The Carvin Allan Holdsworth H2 and HF2 Fatboy Signature guitars were fine instruments, and Allan was playing them exclusively when they were introduced in 1996 and 1998 respectively. But in recent years, I noticed that he had started to use his Bill DeLap custom guitars again, his main guitars before the Carvins. A likely reason being that DeLap's headless design made them more compact and able to fit into an airplane's overhead compartment, an important consideration especially with all the restrictions to carry-on luggage these days. With the recent introduction of the Carvin Holdsworth Signature HH1 and HH2 Headless Guitars, Allan Holdsworth fans can finally get their hands on something very similar to Holdsworth's DeLap without the long wait or hefty price tag. The HH1 comes with a single humbucking pickup at the bridge -- long Holdsworth's favorite configuration -- while the HH2 comes with two humbuckers for more tonal versatility. Both models feature chambered alder bodies, birch tops, Eastern hard rock maple set necks and a 25.5 inch scale. The 20 inch radius ebony fretboards are a carry over from the original Carvin H2 and HF2 models, making for an extremely flat playing surface, allowing extremely low action for effortless legato playing. Both the HH1 and HH2 come standard with a JCustom Headless Research hardtail bridge, with an optional upgrade to a JCustom XS-Trem tremolo system. Carvin also offers its huge array of wood options, allowing further customization of the Holdsworth Signature HH1 and HH2. 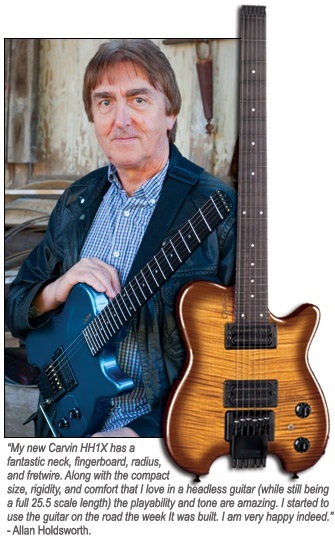 Check out this link to my earlier article on Allan Holdsworth's Ibanez AH10 Signature model.